Accurate flow measurement in full pipe applications. The QC-DT-1 Hybrid Ultrasonic Flow Meters can measure fluid flow in virtually any fluid in which sound waves can travel. The QC-DT-1 meters are considered "hybrid" because they can measure fluid flow using either the Doppler or Transit Time methods. The QC-DT-1 ultrasonic sound transducers are clamped to the outside of the pipe wall and include no moving parts. This method of flow measurement is safe, non-intrusive, and very easy to service. The Transit Time measurement method requires relatively "clean" fluid to enable the sound to complete their circuit. 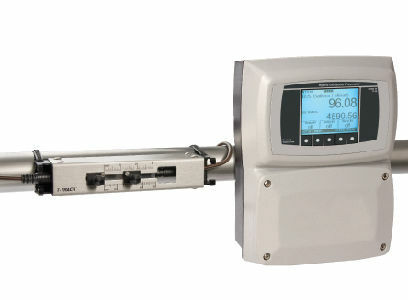 The meter may be operated in the Transit Time mode when the fluid contains 0% to 10% (0 to 100,000 ppm) of particles. To allow for changes in the fluid's particle count, the S2 monitors the signal gain and employs an Automatic Gain Control (AGC) algorithm that periodically adjusts the gain to maintain the optimum power level. The Doppler measurement method requires particles to be present in the flow stream to "reflect" the sound waves. The meter may be operated in the Doppler mode when the fluid contains 0.02% to 15% (200 to 150,000 ppm) of particles.